Not all floors are rectangular. Not all dance floors stay in one room. While Wooden Kiwi offers 2 subfloor systems: our permanently installed kiwiFLOOR Studio System, and a panelized version, the Rosco Subfloor system, we also have considerable experience creating custom solutions for specific applications, from simply engineering a way to fit a portable floor around a column to custom painted finishes from our professional scenic shop. 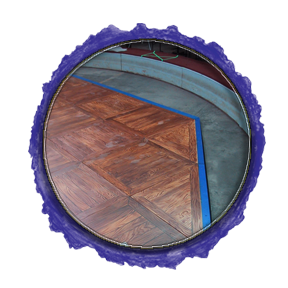 From creating a weather-proof quickly changed painted floor for the Big Apple Circus to engineering a sprung floor to fit under a pre-existing divider. From designing a floor that muffles the sound of tap dancers for the tenants below to creating a radiant heated sprung dance floor. We have even built the Tap Mahal, an acoustically isolated home dance studio for a world class tap dancer, Josh Hilberman. We have the knowledge, imagination, and creativity to design floor to meet your dance or performance needs. Contact us today. Most recently, we have designed what we call the Tamboo Tap Mat, the portable solution for the tap dancer on the go. It is a roll up mat that allows you tap anywhere. Tap Mats are 4' x 6' and roll up to store in a 6" diameter tube. Retail is $289/mat but please contact us for discounts and specials.